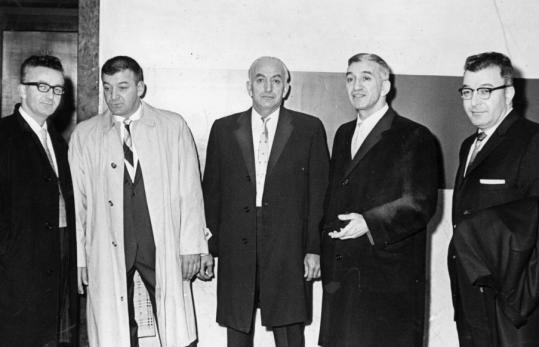 It was Boston’s first big Mafia case. New England mob underboss Gennaro “Jerry’’ Angiulo was captured on FBI tapes played at his 1985-86 trial ordering a soldier to “stomp,’’ stab, and strangle a witness, bragging about his crimes and berating underlings. Mr. Angiulo, 90, who outlived most of his old gang and witnessed the decline of the local Mafia, died Saturday at Massachusetts General Hospital of renal failure from kidney disease, according to his lawyer, Anthony Cardinale. The once powerful mobster, who ruled Boston’s rackets from the 1960s until the early 1980s, considered it a personal victory that he survived 24 years in prison, won his release two years ago, and died a free man, friends said. A former associate, who spoke on the condition of anonymity, called Mr. Angiulo unique and said his death marked the end of an era. The son of Italian immigrants who owned a North End grocery store, he grew up with five brothers and a sister on Prince Street. He graduated from Boston English High School in 1936 and served as a Navy boatswain’s mate during World War II. The Angiulo brothers, who owned nightclubs, were publicly named in 1963 as members of La Cosa Nostra, more commonly known as the Mafia. Gennaro Angiulo had a reputation as a shrewd businessman, and his ability to make money on the rackets endeared him to New England godfather Raymond L.S. Patriarca, who anointed him underboss of the Providence-based crime family. The position put him in control of the family’s business from Boston to Worcester. But Mr. Angiulo thought he was untouchable and was very comfortable doing business from his North End headquarters, which proved to be his downfall, Foley said. The FBI planted bugs inside Mr. Angiulo’s headquarters at 98 Prince St. and at a nearby social club at 51 North Margin St. for three months in 1981, gathering enough evidence to take down the hierarchy of the local mob. He never returned to his dinner. He was demoted as he sat in jail without bail, awaiting trial on federal racketeering charges. During the eight-month trial of Mr. Angiulo and his brothers Francesco, Donato, and Michele and capo regime Samuel Granito, jurors heard evidence of murders, gambling, loan-sharking, extortion, and corruption. In one conversation, Mr. Angiulo ordered the killing of a Combat Zone bartender after concluding that he wouldn’t “stand up’’ when called to testify before a federal grand jury investigating gambling and loan-sharking. The plot was thwarted when the FBI warned the witness. The trial judge, late US District Court Judge Davis S. Nelson, repeatedly reprimanded Mr. Angiulo for muttering, cracking jokes, and making faces while the jury was listening to evidence. Mr. Angiulo often shouted, “splice!’’ when FBI tapes were played. He was sentenced to 45 years in prison on 12 counts of racketeering, gambling, loan-sharking, and obstruction of justice. A self-styled jailhouse lawyer, Mr. Angiulo represented himself in numerous unsuccessful bids to overturn his conviction. In one failed attempt, Mr. Angiulo argued that he had been framed by the FBI and its gangster informants, James “Whitey’’ Bulger and Stephen “The Rifleman’’ Flemmi. It had been revealed in federal court in 1998 that Bulger and Flemmi had visited Mr. Angiulo’s headquarters at the FBI’s request in late 1980, then drew agents a diagram with instructions on where the bugs should be planted. Mr. Angiulo, who had been incarcerated at the federal prison hospital in Devens, became a free man when he was paroled on Sept. 10, 2007. He had been undergoing dialysis treatment since his release from prison and living with his wife, Barbara, at their waterfront home in Nahant. His brother Donato died in May; his brother Michele died in 2006. His brother Francesco “Frank’’ Angiulo, 88, lives at the same Prince Street apartment that was bugged by the FBI decades ago. In addition to his son Jason and wife, Mr. Angiulo leaves another son, Gennaro Jay; a daughter, Barbara; and another brother, James. A funeral Mass for Mr. Angiulo will be said at 10:45 a.m. Thursday at St. Leonard’s Church, at the corner of Prince and Hanover streets.